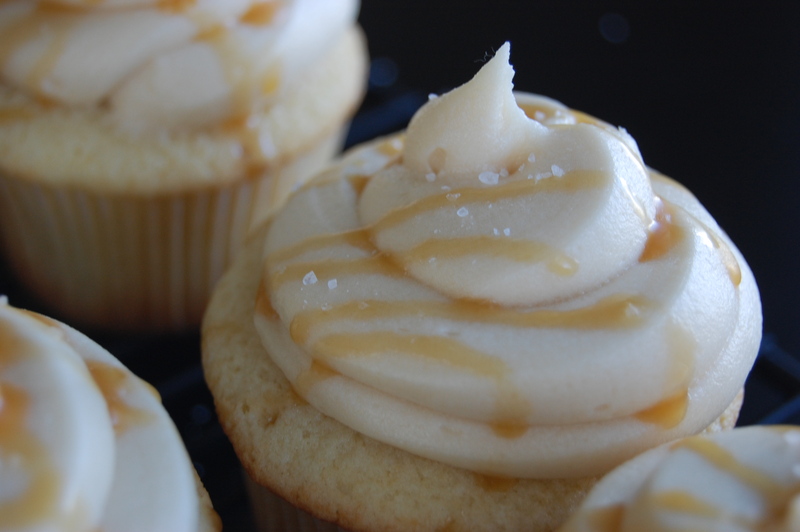 Salted Caramel is all the rage these days. I honestly had never really tried the combo but after hearing about it over and over again I decided to go for it. I made a basic vanilla cake very similar to Katie’s Lemon Cupcake recipe except I added caramel creamer instead of lemon and played around with the icing until I got it just right. 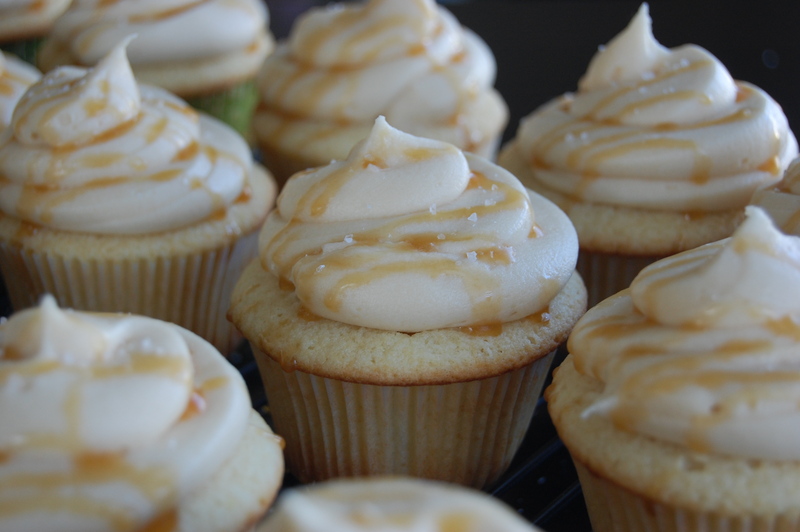 One bite of these salted caramel cupcakes and I instantly figured out what all the fuss was about. Seriously, the addition of salt is genius. It makes all of the flavors pop. I was somewhat hesitant to add sea salt on top of the cupcakes, but once I did and gave it a try I was hooked. Preheat oven to 350 degrees. Line 2 standard sized muffin tins with 24 liners. Combine flours together and whisk. Set aside. In a large bowl, cream the butter and sugar. Add the eggs one at a time, beating after each addition, then the vanilla. Add the flour in 3 batches, alternating with the the half and half and creamer as you go. Spoon the mixture evenly into the lined muffin tin. Bake for 15-17 minutes. Let cool. Blend the butter and caramel topping together until creamy. Add powdered sugar 1 cup at a time, adding small amounts of milk as you go in order to reach the right consistency. Beat until creamy. Frost the cooled cupcakes. 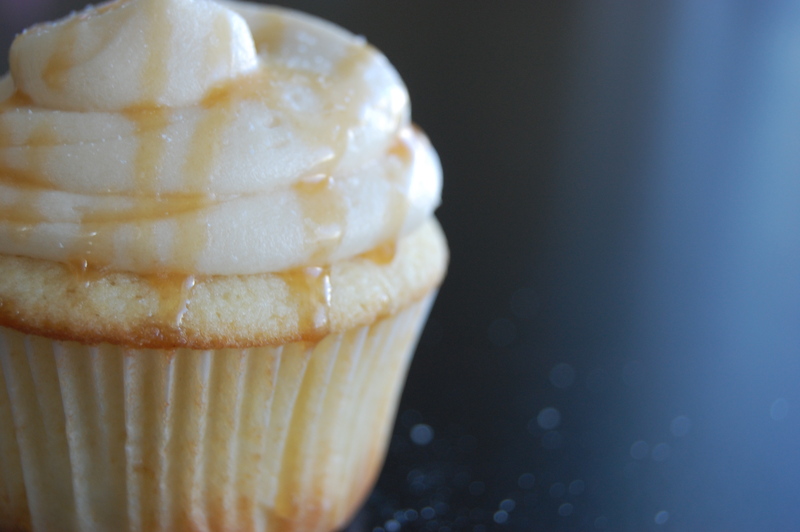 Drizzle with caramel and top with a pinch of sea salt.